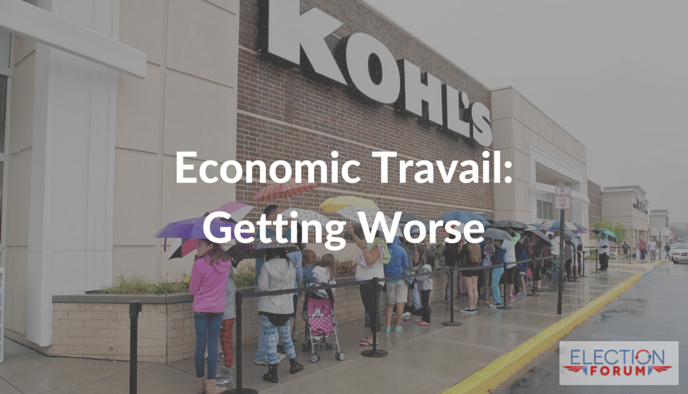 The latest economic report has come in, and instead of improving, the economy is getting worse. And all of this after eight historic years of the economy going … nowhere. Tell me your thoughts. Email me at [email protected]. And Obama says the economy is improving! Yeah, right. He has his quislings doing his shopping for him, so he has no idea what’s happening “in the real world”. Granted, part of the reason is the Internet, but not all of it. Can you say, “President Trump, here we come!”? “Her princes within her are like wolves tearing the prey, by shedding blood and destroying lives in order to get dishonest gain. It’s avarice that is causing this Economic meltdown, that and pushing aside all that is Godly and good! No one man, or woman, is going to bring this country back to it’s former glory, until we admit that it was God who gave us that glory!